Twelve years ago if someone had told us we would sell nearly all our possessions, move 8,000 miles away and return home to the United States richer than when we left, our brains would not have been able to process such craziness. But like the first disciples, who must have seemed a little crazy to leave their fishing nets to follow Jesus, we felt called to follow Jesus to the margins of Tanzania. Now as we complete our overseas mission, we look forward to the next leg of our vocation journey and sharing what we have learned. Our personal path as a couple started when we met as freshmen at Boston College, a Jesuit, Catholic university in Chestnut Hill, Mass. 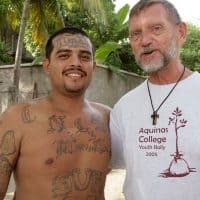 Separate short-term immersion trips during our undergraduate years planted in us the seeds for mission, watered by the Jesuit formation to live as “men and women for others.” We each began to sense a call for long-term mission, which kicked off a six-year discernment process as we honed our professional skills. Michael earned a master’s degree in business administration and developed marketing strategies for a beverage company in Dallas, Texas. Ashley, with a bachelor’s degree in international relations, worked for the Department of Justice in Boston before she relocated to Dallas to begin married life with Michael. That’s when the call to mission kicked into high gear. Michael and Ashley Leen with daughter Fiona, born last January. 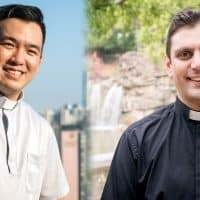 Desiring to help bring about a more just and compassionate world and live out Gospel values in a tangible way, we both felt the Holy Spirit leading us overseas with Maryknoll Lay Missioners. For the past three and a half years, we had the privilege of serving in the Mabatini slum of Mwanza, Tanzania. It can best be described as a heavily populated informal arrangement of substandard housing lacking reliable sanitation, water or electricity. 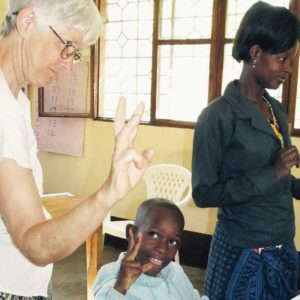 Michael founded and managed a ministry in partnership with a local non-governmental organization that equipped 500 Tanzanians with business skills. 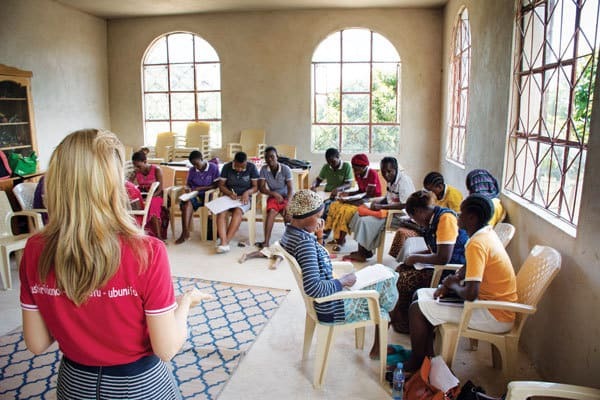 Ashley co-directed LULU Project, a community-based organization that empowered more than 600 Tanzanian women to work together to develop skills to support themselves and their children and pave the way for healthier futures. The birth of our daughter, Fiona, in January 2017, further enlivened our ministries. We were overwhelmed by the happiness Fiona brought to our neighborhood. In Tanzanian culture, the family is critically important. 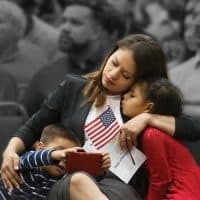 First-time parents even receive a new identity. We will be forever known as Baba Fiona and Mama Fiona, titles we are proud to carry. We went to Tanzania recognizing that those we would encounter have inherent resources and strengths, but we had no idea how much we would learn from the people we were privileged to serve. In particular, Tanzanians taught us to practice unbridled hospitality. We can still recall the very first Tanzanian family that welcomed us into their home. The family was large and living in extreme poverty. But the mother prepared a hot meal and served us, without feeding her family. 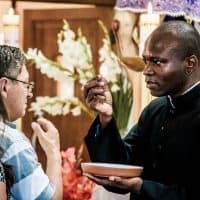 She could not afford to feed her own husband and children as well as her two guests, so she chose the two guests—foreigners—she had just met. Ashley Leen trains women and girls through weekly meetings to empower and help them to discover their talents and plan their future. Time and again, we were the humble recipients of such unbelievable generosity and warmth from those who give from their poverty, not their surplus. Moreover, Tanzanians taught us to have complete and utter faith. Conversations with neighbors, co-workers and those in our ministries constantly revealed their depth of faith. “God is with me.” “God will protect and watch over us.” These are the messages that poured forth from the voices of those who have all the reason in the world to despair. The resilience and joy of the Tanzanian people will forever remain with us. So what now? 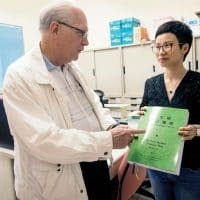 After relocating to Washington, D.C., Michael has begun working with an international organization committed to promoting financial inclusion and creating economic justice for all. Ashley is pursuing a law degree, which she hopes to use advocating for the rights of the most vulnerable members of society. As for Fiona, she is just busy keeping her parents busy. We go forth embracing the charism of Maryknoll, ever seeking to live a mission-driven life. 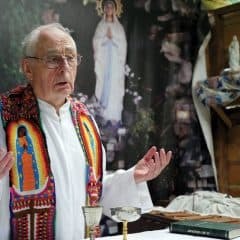 As we first heard from Maryknoll Father James Eble in Tanzania, every community has its center and edges. Maryknollers may come from the center but exist to go out to the edges, to those who live on the margins. We return to the center to share our experiences but ultimately go back to the edges because that is where we are called to be. We are edge people. We encourage other couples and families to embrace the craziness required to go out to the edges and immerse themselves in the reality of life, as Jesus did. Featured Image: Michael Leen coaches Mariam Feruzi on improving operations in her hair salon. (S. Stanton/Tanzania). 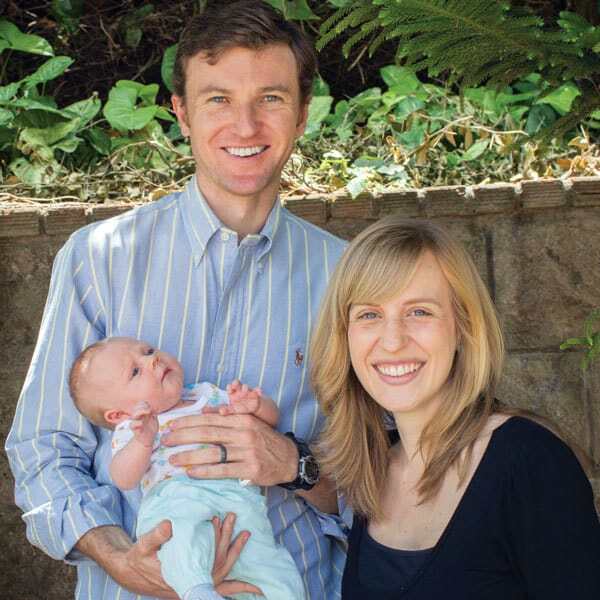 Michael and Ashley Leen served as Maryknoll Lay Missioners in Tanzania for three years and a half.